Soak urad dal, thuvar dal and green gram (Moong) dal in water for about an hour. After an hour clean the dal and drain out the water completely. Now add red chillies, salt and grind it to a thick coarse paste without adding any water. Now chop the onion, green chillies and coriander leaves. Then grate the carrot. Slit the beans lengthwise into four and chop it into half inch pieces. Then finely cut the cabbage into small pieces. Add all the chopped vegetables, onion, green chillies, coriander leaves and coconut gratings to the dal paste. Then add salt, a pinch of asafoetida powder and knead well. Now heat oil in a kadai. Take a small orange size dough and keep it in plastic sheet. Wet your fingers and pat it slightly and make round vadai. Make a hole in the centre and gently remove it and put it in the hot oil. You can fry three to four vadais at a time in the oil and fry till it become golden color. Remove and serve with coconut chutney or simply have it as evening snack with tea. I tried this recipe. the vadas very crispy and not oily at all. Very healthy and nice. thanks for the recipe. Thank you Niranjana for your kind feed back. Very healthy recipe.I really love this one.Very tasty and yummy. I have not tried Vadas much thinking of its long process. But this looks very easy. 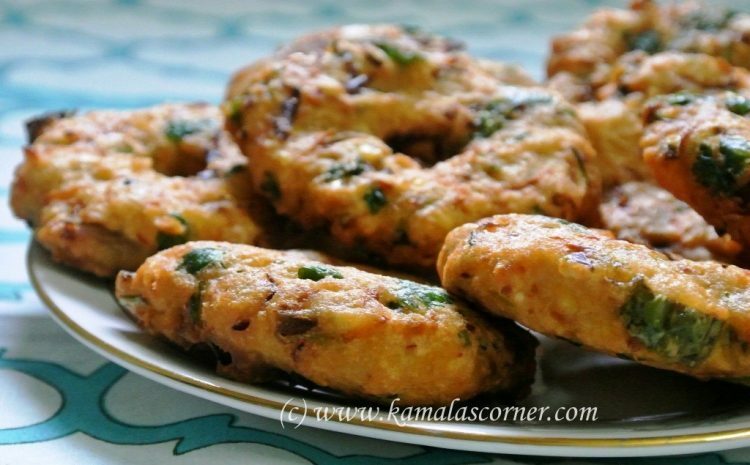 Lemme try this Sunday and will put my comments..
Vadas look perfect Kamala..I have had this from Sangeetha Restaurant and wanted to try this for a long time…Thanks for the recipe..will try this soon. Could you tell me how did you grind it? did you use a mixer grinder or wet grinder? I used mixer grinder only. Welcome to our site. Hope the recipes will be useful to you. Pl do post your comments after trying.